As the staff begins to return to the branch, Don and I decided to take off on a paddling trip across the bay and decided to camp at a new location. The weather is unsettled and we are treated to some great vistas. With all the rain that has happened this fall, the desert is quite lush. Most of the shrubs that loose their leaves in the drought periods are fully leafed out. One of our goals for this trip was to hike across the top of the peninsula to the other side. The map we use has a trail marked, but in reality it is following a large arroyo with no signs of the trail. That is until we almost get to the other side when we find an obvious road for about 100 feet. The trail leads to an abandoned mine on the Sea of Cortez. Many old foundations are scattered near the beach. At one time over 1000 people were employed here. It has taken us about 4 hours to do the hike as there is a lot of meandering of the arroyo. We make it to the beach as the clouds start coming in. Along the way we find the remains of a large deer antler. This year has been good for the wildlife. With the clouds moving in we are treated to a magnificent sun set. A couple of walking sticks prevented us from getting into our zip bag until they were finished. The female is quite a bit larger than the male. Back to the branch we meet our students for the second course of the season. Great weather to start the course. The weather started out great, but when the wind picked up we headed to shore and taught classes. Cooking classes always hold everyones attention. As we continue our travels to Coyote Bay we are amused by this sign painted on an abandoned building. With all the news from the States this made us laugh. We arrive at the NOLS Mexico branch in time to celebrate their version of Halloween. Fun and unique costumes were at the party. We think this was Leslie in her cocoon. Jim always is The Pirate! Early November to early December found us back in the NOLS Instructor role as we led a group of students from the Fall Semester down the Northern Route from the branch to almost Loreto. The tarps were needed for shade. When the course was over our youngest son Jeff, arrived to Baja. Coming from Portland he was excited to get out of the rain and snow. The weather could not have been any better as we paddled out to Punta Concepsion. 13 miles later and Jeff was ready for a break. The week went by quickly with visits to our friends at San Nicolas and the beaches of SanJuanico. and of course I got to point out the brown booby to Jeff. Too soon we had to drive to Loreto and put Jeff on the plane, back to the rain. But first a couple of kid/parent shots. A memorable day occurred when doing a day paddle we were surrounded by 5 whale sharks. As we let our kayaks drift they swam under our kayaks and continued eating at the surface. Having a fin surface near your boat is always an adrenaline rush until you realize it is the friendly whale shark. Their spots determine their individual identity. With their eyes out to the side it was hard to tell if it was looking at me. As folks left the branch after the Christmas party. Our pace slowed and it was time to check out the birds. Another beautiful sunrise greeted us this morning. It was a good morning to breathe in and take in the surroundings. The morning greeted us with a beautiful sunrise. We never get tired of Baja sunrises. And just as we expected we would have a carry to get to where we could put our boats in the water. We were glad when the sand was hard and we did not sink in with each step that we took. Finally the last bit of gear and our boats made it to the waters edge. A reddish Egret entertained us as we were walking back and forth. They have quite the technique for getting their food. Back to the boats and returning to the beach that we started from 10 days ago. We had some great sea turtle sightings. One turtle had several large barnacles on its back. Several sea lions checked us out as we appreciated the day of calm seas. Decided to stop and do some snorkeling and were pleased to see a variety of fish. Then it was time to head back to camp. The hills have mellowed out this last stretch. We made it back to Camp Archleon by late morning. Time enough to sort our gear, head to town, do laundry and check our email. Always glad when there is nothing that we have to deal with. Another beautiful coastline that we have gotten to appreciate. This may have been one of the most isolated stretches that we have done. Mileage paddled 15.2 nautical miles. We had gone to bed rather early so by 4 I was ready to get up and make breakfast. Most of the beaches along this stretch are exposed to the North which means any wind blowing builds swells and the waves crash on the shore all night. Sometimes just listening to the waves does not indicate what the wind is actually doing. We were glad when we actually looked out at the sea state that the conditions were good to go. Our next stretch according to a book that we read is the crux move for the whole coastline. We will be rounding a major point called Punto Remidios. Not only does this point build big waves one also has to deal with a strong current. Unfortunately the current was against us and we used the shoreline to move between eddy lines. We were relieved when the point was behind us. On the way north we had passed by several large bays. Since we had made good time on our return trip, we took the time to do some exploration One place that stopped had exposed sand at low tide. The rocks were well rounded and somewhat comfortable. A red butte could be seen for many miles It was fun to finally paddle by it. Once we rounded the point the seas calmed. We could see a sea of white in the channel to the East. Glad we were here. A beautiful sandy beach was our destination. From a distance one could make out a man made structure. There was a trail leading up to it and so we beached the boats and went for a hike. Half way on the hill was a shrine. We were curious about the history of the placement. Below on the beach was an abandoned old van. At some point in time this beach had been inhabited. The view from the top was beautiful. Not a bad place to spend some time. We left this place and continued along the shoreline. We found a secluded area that would work for a camp, however we were not sure how far the tide would recede. The sand seemed firm enough so even if it did, it would just mean a longer carry. The decision was to stop and enjoy the afternoon. Still water in the lagoon, but not for long. As the sun set the water departed. Meanwhile we set up camp, read and made bread. Glad for a tarp to make shade. With it being so well protected, we will finally have a night with no waves crashing on the shore. Will be interesting to see what our carry will look like in the morning. Mileage paddled 14.4 nautical miles. The wind blew most of the night so we wanted to get a good visual on the sea state before making the decision of staying or going. As we were eating our breakfast the wind began dying some and had switched to the north. We decided this was going to be a go so all of our gear was packed and loaded by 8. The sunrise was a real treat. Guess my rock piling on the tarp was a bit overkill, but I definitely did not have to worry about it getting blown away during the night. So how many rocks does it take to out wit the wind? The sunrise was a real treat! By the time we were loaded and heading South, most of the clouds were gone. We were hoping that the wind would push us and the current would as well, at least for some of the day. we passed by the herd of sea lions that had been sleeping on our way North. There were still some sea lions sleeping, but the waves were too big to take photos. When the red rock campsite came into view, we decided to pull off and take a break. The wind had picked up some and if it continued to build we would need to stop. We know of several pull outs in the next section so thought that we would continue on and do nowcasts on the weather. We also are going to be paddling around numerous points today which once we get around they will give us protection. One of the pullouts that was an option had a boat covered with a tarp and a man sleeping on a rock nearby. Our next break was taken at Pointe muerto. On the beach was what we thought was an abandoned palapa, as it lacked a roof or sides. We decided to take a walk towards it to stretch our legs. Getting closer we realized that there was a man sleeping. No boats were around and we did not want to investigate any further so we back tracked and returned to our boats. The man continued to sleep so not sure why he was there. Beaches with covered boats and men on shore with no boats on isolated beaches give an eerie vibe. The volcanic activity here has left a colorful landscape. As we rounded Punta Candalaria we began experiencing large standing waves. We were hitting the mid rift currents. Glad that we were in a good moon cycle and the waves were not as large as they could have been. Found a campsite by 4 and after having a noisy sleep from the previous night we plan on going to bed early. Mileage paddled 21 nautical miles. We left our beautiful sandy beach near first light just as a pair of Western or Clarks Grebes floated by our boats. The seas couldn't have been any calmer or the skies more radiant. Always amazed at how quickly conditions can change. We rounded the many points of Punta Final. A great blue heron watched us go by. He seemed to be enjoying the morning light as well. This part of the coast feels quite remote. The cliffs along the shore are quite steep and the pull outs are minimal. Fortunate for us we do not need to land. We can just enjoy the scenery as we pass it by. A guidebook that we have been using talks about the beautiful Ensendada Blanca. Perhaps we will check it our for a place to camp tonight. The Bay is located right around the point. It was a cozy night. Mileage paddled 22 nautical miles. With Gonzaga Bay in sight we headed in that direction. Six miles away and it seemed to take for ever. Fortunately the wind was calm so we figured that we must be going against the current. On the way Don saw a yellow butterfly that had landed in the water. Its wings were spread and it looked like a photo op. As Don readied the camera, the butterfly moved and Don was able to scoop it up with his paddle. We figured that it must have gotten exhausted and had fallen onto the water. After several moments of resting on Don's deck the butterfly took off. More butterflies were sighted doing the same thing, just resting in the water before resuming flying. We were amazed at this observation, having previous thought that their wings would become saturated with water and they would drown. Packing up our kayaks to head to Gonzaga bay. We had plenty of water left so perhaps we were being a bit conservative in our water needs. But in the long run there was no water stress. It did make for boats being rather slug like. Upon reaching Gonzaga Bay, Don takes our droms and walk about a mile to get water from the store. I waited at the beach with our gear and watched people as they enjoyed the ocean, We are glad that we got here early and can start heading south today. The beach is too crowded for us to want to stay her. No one passed Don on the road so he got a bit of exercise. He returned with water and a cold drink. What a treat. Waiting for Don to return with water. It did not take long to repack our boats and head out. The wind began to pick up and so did the waves. We may just make it back to the beach that we camped last night. Our boats are heavy once again with water, but at least the food has gone down. We aim for a well protected Bay and are soon in calm water with a beautiful white sand beach, but more important natural shade. After having made camp the last several days as the sun was setting, it feels great to have a more relaxed afternoon. One thing we have noticed in this last stretch of paddling is the dryness of the hillsides. There are lots of elephant trees, but none have any leaves. We had arrived at our campsite late last night and were not able to get photos of this spectacular location. So instead of leaving at first light we decided to have breakfast and wait for the sunrise. The pancakes with homemade applesauce was a treat as we waited for the rays of sun to hit our red rock back drop. We were soon surrounded by a circle of red as the sun rose and lit up the cliffs. We pushed off, but it would have been easy to stay here and to go exploring. Heading North to check out what is around the next point. The wind is from the west this morning, but instead of switching to the North which is normal. The wind shifted to the South and pushed us along in the direction we were heading. A group of porpoises swam by coming quite close to the boats. Always fun to see these mammals swim by! Another fun sighting was sleeping sea lions. We envy their ability to just hang out with their nose barely above the surface and their flippers extended to the sky. The coastline is changing from mainly steep cliffs to areas with some large beaches. We also passed by the only village of this section. It seemed rather abandoned as there were no boats or people. A road can be found here, but it sounds like it is rarely used if at all. A beautiful beach is nestled between the mountains. Too early to stop. With the wind pushing us and also going with the current, we are making good time today. Still time to admire the unique rock designs along the shore. As the sun is setting we pull onto a beach made entirely out of pumice. It will do nicely and the lights of Gonzaga Bay are in the distance. It was a stretch goal today, but with the help of wind and currents we are here! Glad that the tide and waves treated us well during the night. There was no spray on the tent, however the wind was still blowing and the waves were bigger than we wanted to start paddling so it was destined to be a hiking morning. After breakfast we packed up some food and water and went exploring. The arroyo did not disappoint. We walked thru narrow steep passages with a variety of colorful formations. Glad that there is still shade. Quite a difference of temperature between the sun and shade. Lots of evidence of volcanic activity. Too bad there isn't any water in the canyon. It would be fun to continue longer. After an hour or so of hiking, the sun was hitting the canyon floor and it was hot!. It does not take long to get away from the ocean to loose some of the cooling effect. As we headed out to the beach, there was a noticeable decline in the wind and waves. There was still waves breaking on the beach which would necessitate a surf launch, but once thru the waves it looked quite manageable. It was not the best surf launch as we had to do some bailing of our cockpits once we got beyond the surf. After a rest day, it feels good to be on the water again. It was a ways before we saw another landing so our decision to stop the day before yesterday was a good one. We passed by a long sandy beach, but opted to go a bit further since we still had several more hours of daylight and had gotten a late start. Beautiful rock formations, reminiscent of National Parks in the states made the paddle quite enjoyable. Finally it was time to look for a landing and we were grateful to find one that had some protection from the waves. As the sun set we found ourselves next to a red cliff that still had some warmth from the sun. It was dark when we set up the tent and had dinner. The sea still has lots of energy and the pounding of the waves on the shore make it hard to go to sleep. The wind had died some before we went to bed so we may be able to leave in the morning. Trying to be as prepared as possible for unknown circumstances, we plan 3 different scenarios for breakfast. The first would be cold cereal and have our boats ready to leave at first light. the second would be a hot but quicker breakfast and the third would most likely be eggs and fried potatoes which would probably mean that we were not leaving today. About 5 in the morning when it was still dark we heard waves and felt spray on our tent. Looks like it is going to be option 3 but before we can even think about breakfast we need to move our boats and tent as close to the cliffs as possible. We are not in a high tide cycle and know that the tide should be switching soon, so we are not too worried about our location. There is no doubt in our minds that we are staying here today. It is a beautiful morning and later this morning we will check out an arroyo to the south of us. Baja is known for its sunrises! There are very few signs of people having been on this beach, but a pair of ravens have moved in to the area and we take a few minutes to raven proof our gear before hiking down the beach. The waves continue to build during the morning. The arroyo is beautiful and we decide if we are here tomorrow we will return and take a longer hike. Bringing with us our shade umbrellas, water and food. Heading back to the tent and with it being in the shade, we spend some time the rest of the morning enjoying reading and checking out the maps for the upcoming coast. After a lunch made from the bread we baked yesterday we head up the beach in the opposite direction of the arroyo. First stop is a natural arch. Having time to explore is always a good thing. Slowing our pace down we see a crab that has blended in with the rocks. Well maybe not that blended. One creature or should I say numerous creatures are the isopods. They are all over the beach as the tide ebbs. When they see our shadows they are a mass of movement. Fun to watch but glad to know that they stay at the seas edge. And the mass of isopods. We return to our tent and do a bit more moving of our gear to the cliffs. Decided to put our boats behind the tent so if the spray hits our tent in the morning we will less gear to move. The wind is still quite strong as we make our dinner. This does not bode well for moving in the morning. One of the reasons that we chose to do this route in October was the chance of having less wind. At least we have plenty of water and know we can make miles if the weather cooperates. The night started out interesting as a boat approaching the shore kept shining its lights on the beach. Our camp was somewhat hidden so we were not sure if the boat saw us. It was somewhat of a relief when it continued on. In our many years of traveling down here we have never had any problems with camping on the beaches. A stiff westerly wind is blowing when we make breakfast before sun rise. At first light we can see the clouds whipping overhead. It is not as calm as yesterday. Since the wind is from the west we can hug the shore line as we head North and get some protection. It is going to be one of those days that we will keep a close eye on the weather. We are paddling on a stretch of water that does not have many pull outs. The wind is beginning to pick up. As we headed to the first point that we were going to go around today a flock of white egrets and snowy egrets landed on the beach. In their white plumage, it was a great contrast to the shore. We let our kayaks drift by them and they seemed to be okay with that. Usually there are only a couple of egrets in the same location so this was a treat to see so many. As we rounded the first point, the wind was noticeable stronger. We also began to feel the effects of the currents that this area is known for. At certain times of the day the currents can be like a river which you do not want to be paddling against. Knowing that pull outs are limited we begin to check out our options. With the tide going out the beaches are lined with medium to large size boulders. This makes landing challenging. Several sea lions pass us by moving like dolphins. They were having more fun than we were at the moment. We are in a stretch of many points and none of them seem to have great landing options. When we see one that has potential, I head in and am able to get the boat mostly out of the water before my cockpit gets filled up with breaking waves. After unloading several of the water droms I can pull it up further. Don jumps out of his boat in deeper water and I hold it while he unloads his water as well. Looks like this might be our destination for the day. We are able to put our tent up next to the cliffs which provides us with some natural shade. Not ideal for landing, but we were able to make it work. After setting up camp we walk around the next point and are glad that we made the decision to stay here. The seas are building. Glad to be on shore looking out. With time on our hands, I make bread and a tasty meal of lentils, potatoes and dried tomatoes from Jeff's garden. We are looking across to Isla Guardia. One of the larger islands in the Sea of Cortez. Perhaps someday we will make it a destination, but not this trip. Bread always is a treat out here. It was a short paddle day today, but with the natural shade, fresh bread and awesome view we have no complaints. Mileage Paddled 10.6 nautical miles. We awoke at first light to calm seas. It is not going to be an early departure and the carry will be a bit rocky. As we were loading our gear, Don discovers that his hat is missing. Hats are a necessity here so a quick trip to town is required. After several trips of ferrying loads, our boats were finally loaded. We are carrying lots of water and enough food for 12 days. We do not like to deck load our kayaks, but this was not an option for this trip. At least they are still afloat! Wayne comes to the beach and we wave adios. We are off to unexplored coast line. The seas are calm and our boats ride quite low. They feel more like tugs than a sporty kayak. It is always good to know that today our boats are the heaviest that they will ever be on this trip. Heading North with our boats packed to the max. We head out of the bay and paddle for about an hour, before we feel the need to take a stretch. Last time we were in our boats was August and our bodies need to adjust to sitting again. We feel quite fortunate that we are having calm seas for the first day out. We have not been able to get a wind forecast so are back to doing a lot of now casts. With islands to the East of us and cliffs on the shore we are impressed with our vistas. The wildlife today was impressive. Lots of turtles, sea lions, whales and most likely a bobcat on the shore. When it is time to make camp we find a small arroyo that will be perfect for the night. The sun has set and the moon provides us with some light. For the past several long trips we have done we were able to make a lot of our meals in advance and dry them. This is not the case for this trip and we are back to making meals from scratch. They taste good it just takes a lot more time to prepare them. With our boats quite heavy our mileage was less than 2mph, still we are happy to be on the water and looking forward to tomorrow. Woke up early and become prepared for the day of the hub repair. Wayne took Don to breakfast where Don hoped to make a connection with Wifi. The Wifi sign was just a sign and there was no wifi. We have a program on our phone which has updated wind forecasts, a quite useful tool. No internet means no updates. The mechanic had all the parts and did both wheel bearings. After hearing several stories of people needing to go back to the states for the parts for their wheels, we again are quite thankful. Cost of the repair, $120.00. When they returned with the wheels, Wayne had all the tools needed to put the trailer back together. By late morning we were ready to head back to our palapa and get serious about leaving in the morning. We spend the rest of the day packing our gear and checking out the maps. There is no water sources till we get to Bahia Gonzaga which means our boats will need to carry a lot of water, which Don gets in town. After realizing that high tide is at 3 AM we decide against an early morning start. Sometimes it is easier just to go with the flow. Plus the wind seems to be in a rather calm period. The palapa was a great staging area. The moon made it somewhat challenging to sleep. Every time one turns on their back it is as if someone has shined a flashlight in your eyes. I finally found an article of clothing to put over my eves and it worked. Wanting to walk before the sun rose, at first light we put our shoes on and headed down the beach, We even found an abandoned casa to do some aerobic exercises. Returning to our palapa we were aproached by a man called Wayne who we found out has a trailer adjacent to the campground. He has done quite a bit of kayaking and was intrigued by our kayaking trips. As we were talking the owner, Antonia, of the campsite came by and told us that the palapa was reserved for the night and unfortunately the campground was full. Wayne in our conversation before the owner arrived told us that the man that we had met last year who was the owner of Camp Archleion had died of a heart attack and his son was taking over the responsibilities. Upon hearing the information of no vacancy, Wayne graciously offered us his yard for us to park our car and camp for the night. We happily accepted and told Wayne we would be over as soon as we packed up. Antonia told us that tomorrow there would be an empty palapa and that we could leave our car here in a secure location. With that information we have decided to paddle north about 60 miles to Bahia Gonzaga and return to Bahia Los Angeles. We will still have to paddle the coastline from San Felipe to Bahia Gonzaga, but we can plan on doing it in March of next year. As we left to head over to Wayne's house the trailer was making an awful noise. As I looked out the side window, it became quite obvious. The wheel was ready to fall off. The bearings were shot. We slowly made our way to Wayne's and he was there with a mechanic who told us about a mechanic in town who may be able to help us. Wayne and Don removed the wheels and axle and headed into town. It was Sunday and thought there was a good possibility of the shop being closed. It was, however the owner was at his house and said he would check to see if he had the part. Hard to believe but he did and said he could work on it in the morning. So at this point everything is going much better than expected. Wayne offered his garage to help with organization of food for the trip. We have brought enough food from the states for the staples and will only need to buy fresh food tomorrow. It looks like beans and rice will be on the menu frequently. Meeting Wayne was a gift and we hope to pass forward his kindness plus he lives an inspirational lifestyle. Wayne! a runner and kayaker! Wayne's friends and next door neighbors Steve and Linda arrived in the afternoon. They will be spending most of the winter down here with their two dogs. We all shared a couple of Pizzas and Baja stories. Even though our trailer is not back together yet we are feeling positive about the outcome. We spend a little time reflecting on the what if the trailer had broken down in the middle of no where, but quickly remove that thought from our mind and smile as we think where we are now. Steve and Linda have many stories to tell! We were up at first light and took a walk down the beach. Currently there are many empty palapas on the beach. This will change as the migration from winter occurs. One can only imagine what the next months will bring. Several of the occupied palapas have dune buggies and soon they are being driven up and down the beach. 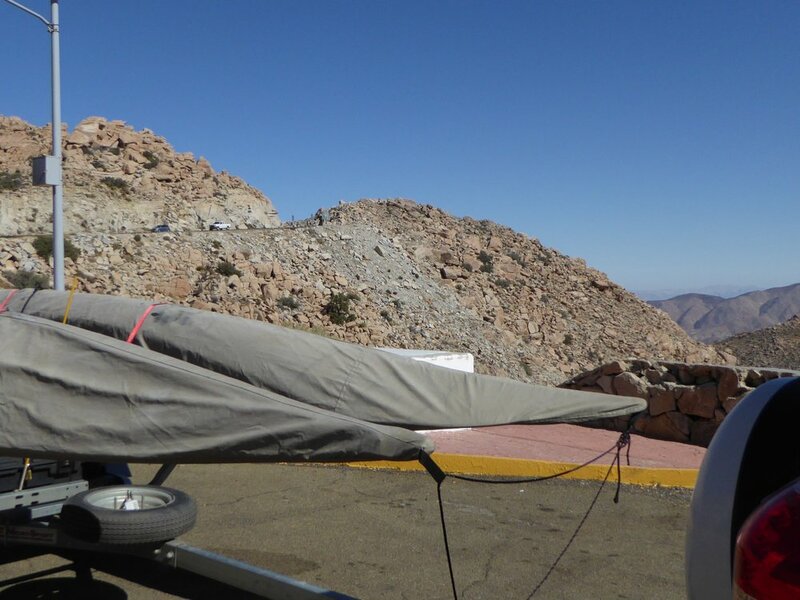 Glad to be able to spend the night here and take note of the tides as one of our goals this winter is to paddle the section of coastline between San Felipe and Bahia Los Angeles. We are also glad to be leaving the campground and heading South by mid morning. We took note of the tides. It would not be fun to land here when the tide was low. During parts of the moon cycle tides can have as much as a 30 foot difference. With the beaches being so flat, that can make for a long way to carry all of your gear. We still have not figured out the logistics for this part of the coastline. Checking out some of the beaches along the way we decide that we are going to head to Bahia Los angeles. Having camped there last year we are pretty sure that we can have a secure place to leave our car while we kayak the coast. A new road is being created from an older road that connected the two coasts. When it is completed it will make traveling from Tecate or Mexicali to the Pacific Coast very efficient. We were on this road about 4 years ago when we shadowed Ryan and his friends doing an off road motorcycle trip. It was quite challenging and we managed to get two flat tires at the same time. Some work on the road is completed, but 20 plus miles is quite rough and not well marked. We were redirected by a truck when we thought we were going on the more traveled road. Not sure where we would have ended up. 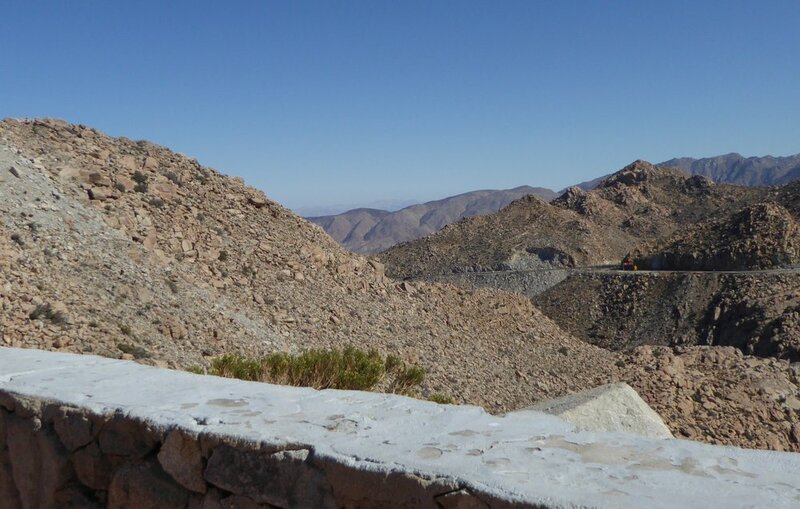 Again we are awed by the beauty of interior Baja, flat plains and mountains are enjoyed as we head East. Fall rain has turned the landscape green. As we see the sign for Bahia Los Angeles we know that in 60 miles we will be back to the Sea of Cortez. The sun has set and the moon is rising. The unique Boojum trees are highlighted by the rays of the moon. We are looking forward to this palace they call Baja. We arrive to Camp Archleon and are relieved to find an empty palapa that we can use. It is fairly late and most of the folks in the other palapas are asleep. We can find the owners in the morning. This is the campsite where we first stayed last January and met a couple who were on year 3 of a motorcycle trip from the tip of Southern South America to the Arctic Sea. We have stayed in touch and were glad to hear that they had accomplished their goal. We also have a goal this winter of finishing up paddling parts of the Baja coast that we have not seen. We are hoping that we can do some of it in the next couple of days. We are greeted bythe moon over the bay...what a vista. Wanting to avoid the early morning rush hour traffic of the morning, we decided to not leave San Diego till after 9:00. That was a wise choice as we easily made it thru San Diego and were soon headed to the boarder town of Tecate. This was our first time doing this crossing and we had heard that the most difficult thing to do there is to find a parking spot where you can park so you can go get your tourist visa. This statement was accurate as we circled the blocks several times to find a spot for the car and kayak trailer. Getting the visa was simple and we were soon on our way to San Felipe. The drive there via the toll road was stunning. We drove thru the mountains winding our way down to the coast. We pulled off at a rest stop to check out the views. We were not sure that we were ready for these kind of temps. We were thankful that when the sun went down so did the temperatures. We pulled into Petes Camp and were happy to be back in Baja! We left Portland Oregon on the 9th with the car loaded as usual. Someday we may get the idea of minimalist car packing, but has not happened yet. Usually we are able to maneuver our "stuff" to the front seats and sleep in the back. This is not going to happen on this trip to San Diego as we are bringing a wine cooler to Ryan. Our usual destination for camping on the way down has a policy of locking the gate at 10. Unfortunately we arrive around 10:30, some of this was due to the snow falling on the mountain passes and causing a slower speed. It was beautiful and fortunately was not adhering to the road. Continuing on we decide that stopping at the next rest area is our best option. Putting the seats back and imagining that we are in a plane with ample room we are surprised at how well we sleep. It was easy to wake up and start driving as I was already in the drivers seat. Traffic was light and we made it to San Diego around noon. After getting the keys for Ryan's garage, it was one of our not favorite activities, unpacking and repacking the car and kayaks for Baja. We spent four days here, doing the usual things. Watching Ryan getting ready to go kiteboarding on his foil. The four days went quickly enjoying our time with Ryan and Beth. Eating out and running errands before crossing the boarder. As usual we enjoyed running and exercising in the nearby Balboa Park.